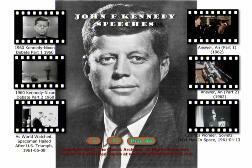 This DVD is a look back at John F Kennedy and the speeches he made. A tribute to the former President that takes you through his administration. After Kennedy's leadership as commander of the USS PT-109 during World War II in the South Pacific, his aspirations turned political. Kennedy represented the state of Massachusetts in the U.S. House of Representatives from 1947 to 1953 as a Democrat, and in the U.S. Senate from 1953 until 1961. Kennedy defeated former Vice President and Republican candidate Richard Nixon in the 1960 U.S. presidential election, one of the closest in American history. To date, he is the only practicing Roman Catholic to be elected President and the only President to have won a Pulitzer Prize. His administration witnessed the Bay of Pigs Invasion, the Cuban Missile Crisis, the building of the Berlin Wall, the Space Race, the American Civil Rights Movement and early events of the Vietnam War. Kennedy was assassinated on November 22, 1963, in Dallas, Texas. Lee Harvey Oswald was charged with the crime, but was murdered two days later by Jack Ruby before he could be put on trial. The Warren Commission concluded that Oswald had acted alone in killing the president; however, the House Select Committee on Assassinations declared in 1979 that there may have been a conspiracy. The entire subject remains controversial, with multiple theories about the assassination still being debated. The event proved to be a poignant moment in U.S. history due to its impact on the nation and the ensuing political fallout. Many regard President Kennedy as an icon of American hopes and aspirations; he continues to rank highly in public opinion ratings of former U.S. presidents. 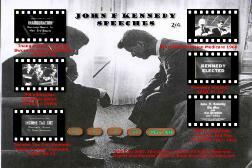 A kinescope of the John F Kennedy and Richard M Nixon presidential debate. The sound quality of the first part of the debate is not very stellar. John F. Kennedy and other dignitaries review the second fleet and second marine division in action. Superb material of combat aircraft, battleships, carriers, sailors, marines. 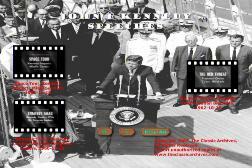 President Kennedy (JFK) speaks to audience of Navy personnel. Alan Shepard flight on Mercury, given medal by JFK at White House, Jackie had to remind him to pin the medal on, parade up Pennsylvania Ave, Shepard as "space pioneer". President Kennedy telling us that while he doesn’t see the Soviet lead in space to be a threat to national security, he does see a threat in the Soviet arms buildup. JFK in Oval Office, goes to inauguration, sits with Ike in stand, LBJ sworn in as VP by Sam Rayburn, JFK sworn in by Chief Justice Warren, JFK speaks "let the Word go forth ... torch been passed .. proud of our ancient heritage ... committed today at home and around the world ... to our sister republics south of the border in a new alliance of progress join with them to oppose subversion anywhere in the Americas" - lunch in the Capital - procession to the White House riding in car, watch parade ended by replica of PT boat on float; night inaugural balls with Jackie. JFK speaks on his income tax cut that he wants to present to Congress in January of the next year. 67 million go to polls on election day, Ike votes, JFK and Jackie vote, Nixon and Pat vote in Whittier, Nixon speaks from his election HQ and concedes defeat; Kennedy wins; JFk speaks, to all Americans I say the next 4 years will be difficult, and the supreme national effort will be needed (cut off). Ground station dish for Telstar at Cornwall, interior, JFK press conference, JFK speaks about the satellite; animations of satellite transmitting. (1) JFK begins space bases tour at Huntsville, meets von Braun, sees Mercury capsule, then to Cape Canaveral, then to Houston and stadium at Rice Univ for speech, then to Manned Spacecraft Center, sees Gemini capsule, then to McDonald plant in St. Louis where capsules built, sees gemini capsule (2) Fashion Parade - leather fashions. Laos crisis brings Macmillan to meet JFK; Gromyko arrives at White House, pose with JFK, Gromyko speaks to the press in Russian, translated into English, speaks about Laos and policy of neutrality; Gromyko responds in English to reporters questions. 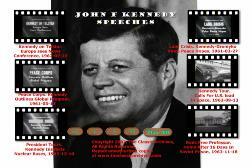 American exchange students already overseas helping with construction projects; JFK speaks about the Peace Corps. (1) JFK arrives at Omaha underground command post; helicopter to Los Alamos (2) snow storm hits East. JFK press conference, speaks about the unjustified arrest of the professor in Moscow; Prof Barkhorn? arrives on plane, returns to Yale campus in New Haven CT.
Cape Canaveral - JFK sees Saturn rocket, then helicopter to see Polaris fired from sub USS Andrew Jackson. JFK speaks on Cuban Missile Crisis - "Soviet military buildup on the island of Cuba" - "a strict quarantine on all offensive military equipment has been initiated" - "clandestine, reckless" - JFK had meeting with Gromyko.